As a site dedicated exclusively to 2D video games, we don't see many (or any) entries in the vehicular combat genre. 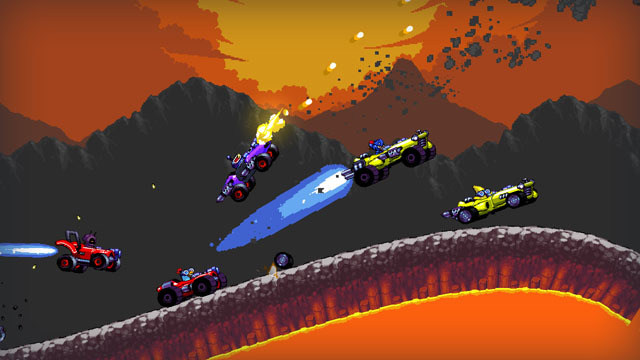 Developer Turtle Blaze is here to turn your head with its stylish 2D sidescrolling car combat game, Intergalactic Race Warriors. Gameplay looks like a 16-bit demake of Redline or some Mad Max film with cars burning up the road - or at least the offroad - with speed lines, shaking chassis, and debris flying everywhere. Players blast away at other cars with machine guns and rockets, while boosting, jumping, and flying off of steep slopes... and hopefully landing wheels-down. Races take place across multiple planets, and players can customize and upgrade their vehicles to make them best suited to their environment.